We had a feeling this year’s Met Gala red carpet would see a lot of vintage-inspired lipstick in homage to designer Charles James’ glamorous gowns, but we had no idea the range would be this varied. Check out some of our favorite colors from the night’s festivities, from classic red to electric purple (really!). Bey’s deep, dark burgundy lipstick complemented the flamenco dancer vibe of her black gown and veil — and made us want to rock a similarly pigmented shade for spring. The model broke up her monochromatic beige look with a seriously statement-making purple pout. With her brick colored lipstick and perfectly on-theme gown, the model oozed old school glamour. Her shade of choice? Estée Lauder Pure Color Envy Sculpting Lipstick in Emotional. 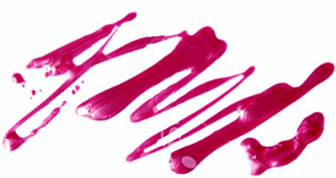 Not only did Selena’s berry lip match her dress to the T, it made us reconsider yet another dark shade for spring. Color coordinated lips and dresses were a theme on the red carpet, as Reese’s fuchsia pairing shows. To create the French beauty’s red-orange lip color, makeup artist Christophe Danchaud blended two shades of Hourglass Femme Rouge Velvet Crème Lipstick: Raven and Muse. Lots of color in her dress didn’t stop the actress from rocking a reddish-pink pout. The shade even matched her earrings. If anyone loves a red lip, it’s Taylor Swift. Her matte cherry shade managed to feel both vintage-inspired and fresh. A red dress plus a red lip on the red carpet can skew a bit too monochromatic. So Hathaway opted for a pinkish shade instead. Chanel Celebrity Makeup Artist Kate Lee used her fingers to smudge on the brand’s Limited Edition Rouge Coco Shine Hydrating Sheer Lipshine in Emotion, which she topped with a balm, Chanel Hydra Beauty Nourishing Lip Care. Makeup artist Jeanine Lobell complemented Kirsten’s ‘20s-inspired hairstyle and Rodarte Star Wars dress with a watermelon shade on the lips, Nars Luxembourg Satin Lip Pencil.